The paper discusses the results of systematic studies of activity concentrations of the 226Ra, 232Th, and 40K in soil and sediment samples of Kali River, one of the major rivers of coastal Karnataka. The samples are collected in premonsoon, postmonsoon, and monsoon seasons; the activity concentrations of 226Ra, 232Th, and 40K in soil and sediment were measured by a NaI(Tl) gamma-ray spectrometer. The activity concentration of 226Ra is high in soil and sediment samples. The activity of 226Ra is almost constant, except one or two sampling stations of the rivers, and the activity of 232Th and 40K shows nonuniform distribution in soil and sediment samples of premonsoon and postmonsoon seasons. The results of these investigations are presented and discussed in this study. Natural environmental radioactivity arises mainly from the radionuclides, such as 40K, 232Th, and 238U series and their decay products. Gamma-radiation emitted from those naturally occurring radionuclides and from the radionuclide deposited on the ground is the main external source of irradiation of the human body. Natural environmental radioactivity and the associated external exposure due to gamma-radiation depend primarily on the geological and geographical conditions and appear at different levels of radionuclides.,, For all practical field applications, only gamma radiation is of importance because alpha and beta radiation is not very penetrating and will generally not escape the matrix. In the present work, the first ever study on the distribution of natural radionuclides in the riverine environs of coastal Karnataka have been presented and discussed. 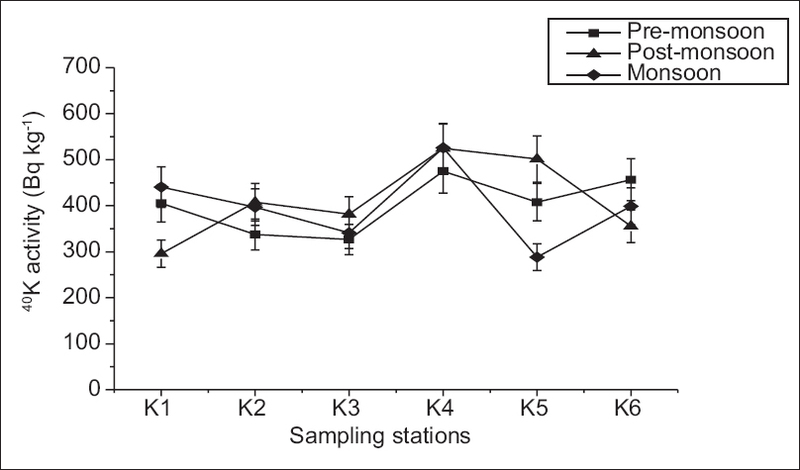 At present, the sampling stations were identified along the river Kali [Figure 1]., The soil samples from the banks of the river and sediment samples from the river are collected during premonsoon, postmonsoon, and monsoon following the standard procedure. The soil and sediment samples collected were brought to the laboratory, dried, grounded, and sieved to get <250 μ and filled in airtight plastic containers and stored to ensure equilibrium between radium and its short-lived daughters. The concentration of radionuclides in the samples were determined employing high-efficiency gamma-ray spectrometer consists of a 5” × 5” NaI (Tl) detector coupled to a 4K MCA. The spectrometer was calibrated using the standard sources., The activity was counted for a sufficiently long time (36,000 s) to reduce the counting error to <3%. In the present work, a simultaneous equation method was employed for the analysis of the spectrum and to determine the activity concentration of the various radionuclides. The activity of 40K was evaluated from the 1461 keV photopeak, the activity of 226Ra from 1764 keV gamma line of 214Bi, and that of 232Th from the 2614 keV gamma line of 208Tl sufficiently long time to reduce the counting error. The minimum detectable activity at 95% confidence interval for a 36,000 s counting time and 500 g sample weight were found to be 2.9 Bq/kg for 40K, 1.0 Bq/kg for 226Ra, and 0.6 Bq/kg for 232Th. 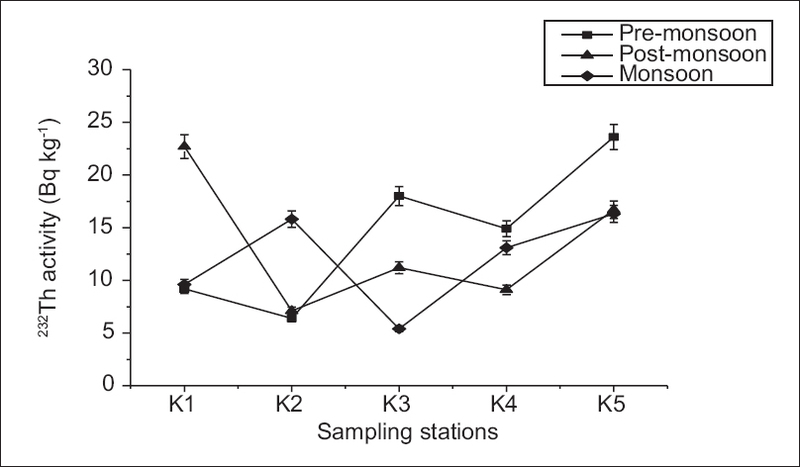 The seasonal variations of natural radionuclides such as 226Ra, 232Th, and 40K activity concentration in soil samples are presented in [Figure 2], [Figure 3], [Figure 4], respectively. The 232Th activity concentration is high in soil samples compared to sediment samples; it may be due to the enrichment of 232Th-bearing minerals in soil samples. It has been shown by several workers that 232Th, in the 4+ oxidation state, is chemically almost immobile in the near-surface environment. 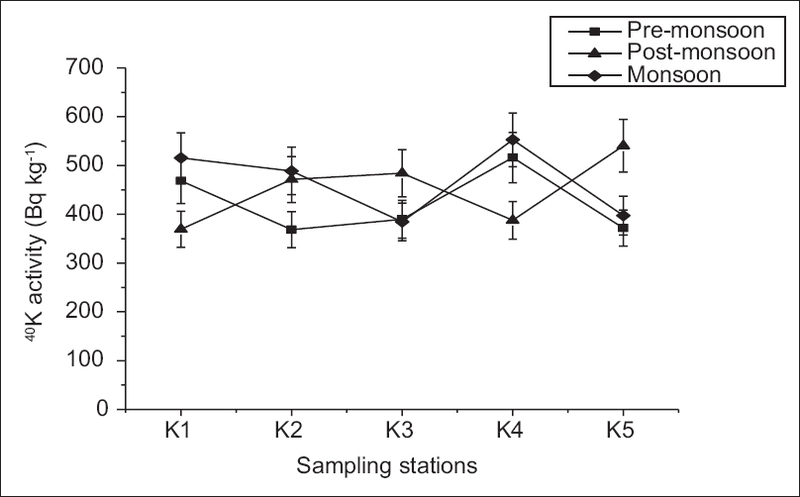 The seasonal variations of natural radionuclides such as 226Ra, 232Th, and 40K activity concentration in sediment samples are presented in [Figure 5], [Figure 6], [Figure 7], respectively. 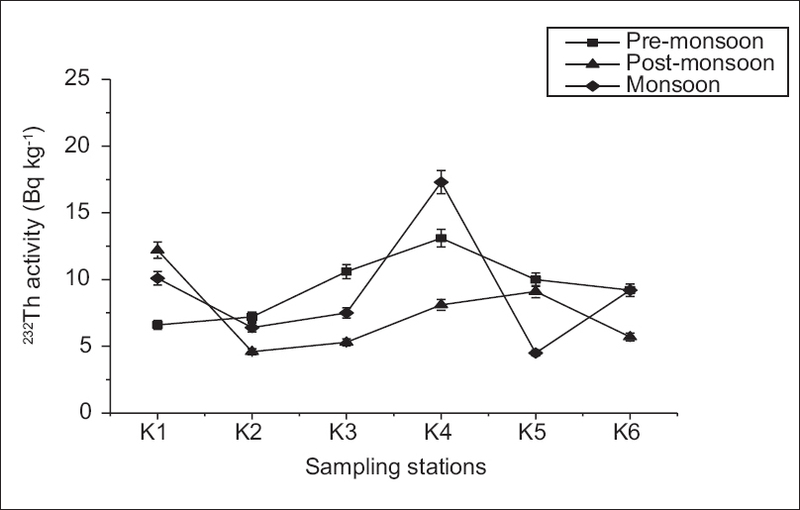 The activity of 226Ra is almost constant [Figure 2], except one or two sampling stations of the rivers; it indicates that 226Ra does not migrate in the Kali riverbank soil. 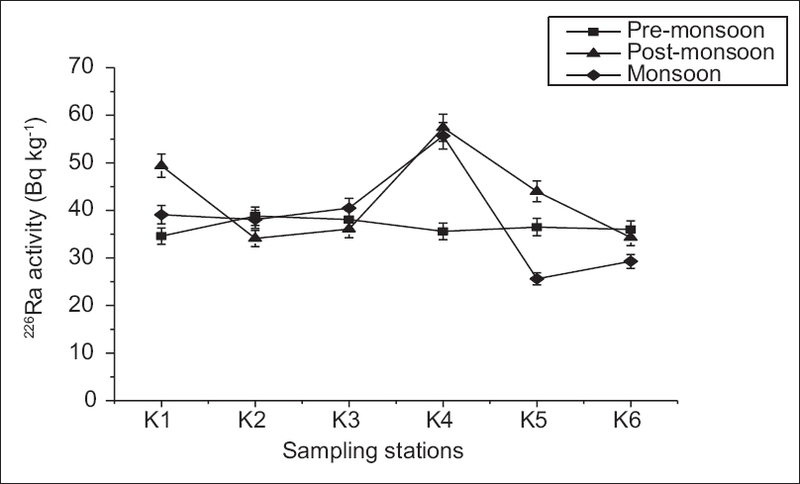 The variation of 226Ra activity in the soil and sediment shows similar distribution [Figure 2] and [Figure 5] and the 232Th activity shows irregularity distribution in soil and sediment samples of premonsoon and postmonsoon seasons [Figure 3] and [Figure 6], respectively. However, in the present study, the radionuclide concentrations in these soils are slightly high when compared to the world average. 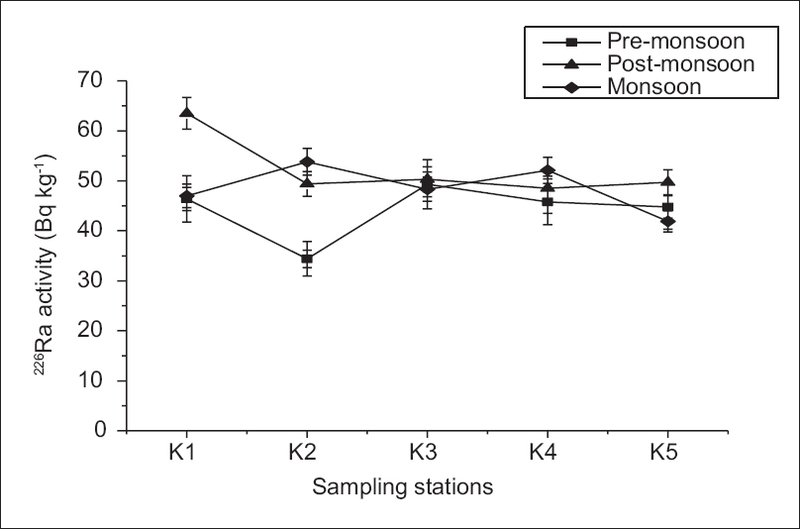 The correlation between the activity concentration of 226Ra and 232Th shows relatively good correlation with correlation coefficient of r = 0.59 and r = 0.84 [Figure 8] for premonsoon and postmonsoon and no correlation of r = 0.01 for monsoon season in soil samples, respectively. 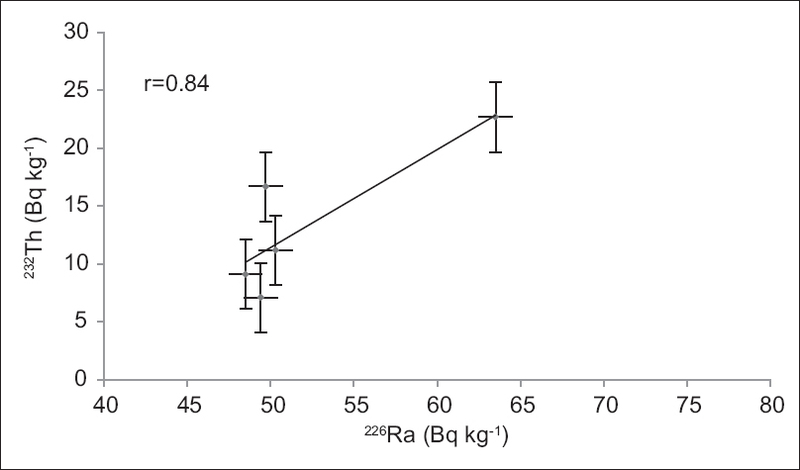 The correlation between the activity concentration of 226Ra and 232Th shows good correlation with correlation coefficient of r = 0.71 [Figure 9]. 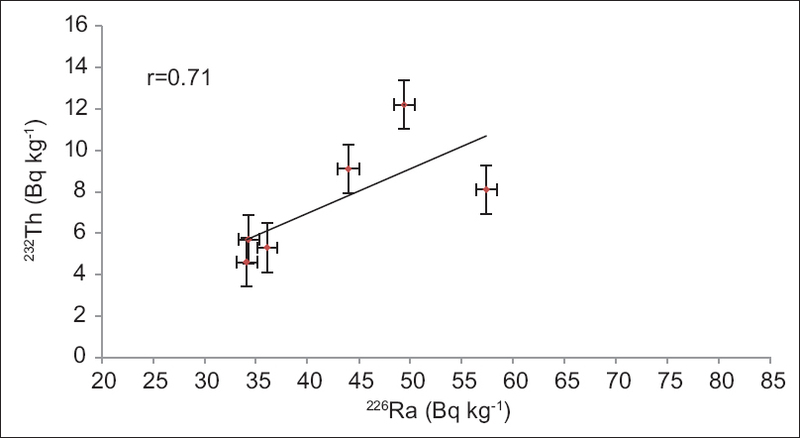 The good correlation between 232Th and 226Ra in sediments samples indicate that the uranium and thorium bears mineral enrichment due to weathering and transport process. In the postmonsoon season, the heavy (radioactive) minerals derived from the gneissic rocks in the drainage basin could be subjected to sorting in the river mouth, leading to higher concentrations of U and Th. Heavy (radioactive) minerals could also be transported from the nearshore region to the littoral currents and the onshore component of the coastal water circulation pattern. The activity concentration of 232Th is high in soil compared to sediment; it may be due to the enrichment of 232Th-bearing minerals in soil samples. The activity of 226Ra is almost constant in the riverbank soil, and it indicates that 226Ra does not migrate in the Kali riverbank soil. The good correlation between 232Th and 226Ra activity in soil and sediments samples indicate that, the uranium and thorium bears mineral enrichment due to weathering and transport process. In the postmonsoon season, the heavy minerals derived from the gneissic rocks in the drainage basin could be subjected to sorting in the river mouth, leading to higher concentrations of U and Th. The authors are grateful to Prof. K Siddappa, Former Vice-Chancellor, Bangalore University, for their encouragement and support. International Organization for Standardization. ISO/DIS 18589-1, ISO/TC 85/SC 2; 2003. Menager MT, Heath MJ, Ivanovich M, Montjotin C, Barillon CR, Camp J, et al. Migration of uranium from uranium-mineralized fractures into rock matrix in granite: implications for radionuclide transport around a radioactive waste repository, Radiochim Acta 66/67,1994, 2/7 1993:47-83. Hamby DM, Tynybekov AK. Uranium, thorium, and potassium in soils along the shore of Lake Issyk-Kyol in the Kyrghyz Republic. Environ Monit Assess 2002;73:101-8. Kidwai RM, Nair RR, Hashinmi NH. Heavy minerals in the sediments on the outer continental shelf between Vengurla and Mangalore off the west coast of India. J Geol Soc India 1981;22:32-8. Manjunatha BR, Harry NA. Geology of western coastal Karnataka. In: Ravindra BM, Ranganathan N, editors. Geo Karnataka, MGD Centenary Volume. Bangalore: Karnataka Assistant Geologists Association; 1994. p. 100-16. Herbert LV, De Planque G, editor. Environmental Measurements Laboratory Procedure Manual. 26th ed. New York, US Department of Energy: Environmental Measurement Laboratory; 1983. Narayana Y, Rajashekara KM. The importance of physico-chemical parameters on the speciation of natural radionuclides in riverine ecosystems. J Environ Radioact 2010;101:958-64. Abani MC. Methods for processing of complex gamma ray spectra using computers. In: Refresher Course in Gamma Ray Spectrometry. Mumbai, India: Bhabha Atomic Research Centre; 1994. Langmuir D. Uranium solution-mineral equilibri at low temperatures with applications to sedimentary ore deposits. Geochem Cosmochem Acta 1978;42:547-69. United Nations Scientific Committee on the Effects of Atomic Radiation. Sources and Effects of Ionizing Radiation. New York, United Nations: United Nations Scientific Committee on the Effects of Atomic Radiation; 2000. Shankar R, Manjunath BR. 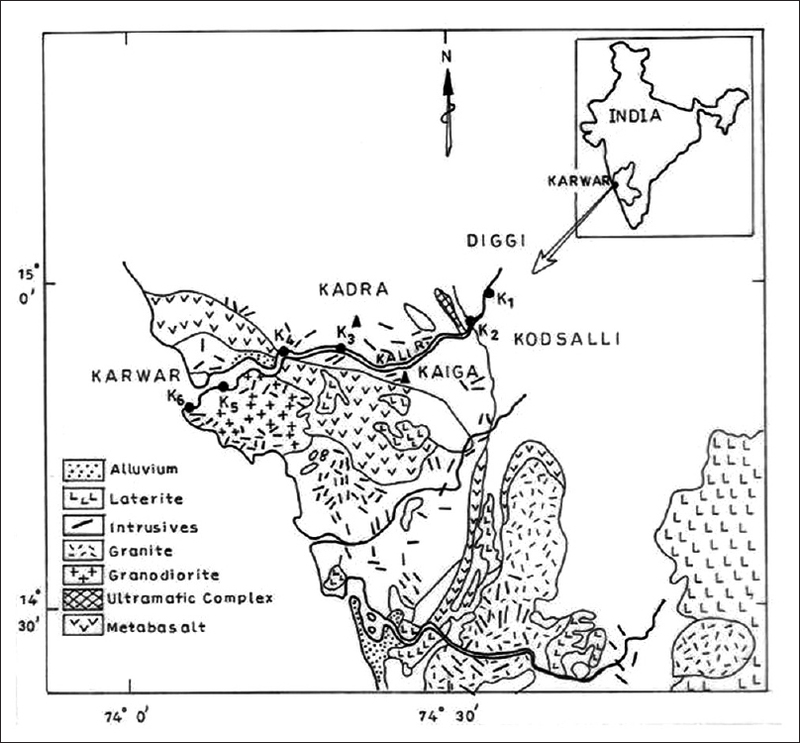 Onshore transport of shelf sediments into the Netravati estuary, West coast of India: Geochemical evidence and implications. J Coast Res 1997;13:331-40.